Was up and out by 6:30. Today the plan was to climb Mount Bossington. That’s right. All 308 feet of it! Ok, ok, it’s actually called Bossington Hill but the path is very steep. As I climbed higher so the clouds fell lower until I was totally engulfed. The wind howled at my back, the rain slashed against me, visibility was minimal but still I ploughed on. I was heading for the Selworthy Beacon and something stupid like inclement weather was not about to stop me! Besides, the climb was so steep I didn’t fancy going back down the way I had come up. Through the gorse I tramped, the occasional trill of birdsong all I had for company. I did see a twitcher in the Bossington car-park before I left but he was hiding somewhere out of sight. Mind you, the clouds were so low he could have been about 20 feet in front of me all the time. My map was getting drenched, my trousers more so when I arrived at the beacon. I’m not sure what I was expecting but a big pile of rocks was not it. 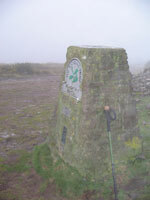 The trig point I can accept. I managed to shelter my camera enough to take a quick snap. 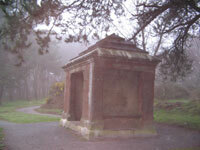 It was then into the weather and down to the Memorial Hut. Oh bliss, oh wonderful bliss. Barton Arundel Acland, I love you! This selfless fellow, as a memorial to his dad, put up a hut in 1878, just knowing I’d need it! I stripped off and sat, resting my poor tired feet and trying to make myself dry. After about half an hour I felt revitalized and headed down towards Bury Castle ‘Settlement’. Fantastic! An iron Age hill fort! And it was all mine! Ok, there was no-one else stupid enough to be trampling around the gorse with me. Anyway, I wandered all over it, wondering what the views must be like (the clouds were still about my head) and marvelling at the ingenuity of early man. For anyone who doesn’t know what an iron age fort looks like, it’s a large circular flat area surrounded by a ditch. Sorry to disappoint anyone who was hoping for a structure. They rotted away long ago. From here the path led me through woods, down thin paths, the edges crumbling away down sheer sides – it doesn’t get much more exciting than this! The clouds gradually lifted until the day was very clear (I’d managed to miss St Agnes’s Fountain) and arrived safely back in Bossington car-park. Looking back up at Mt Bossington, it was completely obscured by cloud. I walked the short distance back to Porlock and finally to the house. 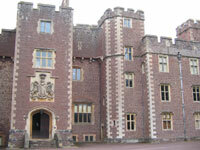 After a much needed shower and change of clothes, we set off for Dunster Castle. We arrived on the day of the annual caravan club meeting. There they were all parked up alongside the car park, discussing such things as the merits of flying a skull and crossbones flag to a St George’s cross and what a pain it is that the owners have to come with them. The castle is an odd place. At the top of the hill, the Saxons built a keep and Aelfric lived in it. When the Normans came, they snapped up the real estate and built their own keep on it. Gradually over the centuries, bits were added and taken away until now when the top of the hill, and easily the best vantage point, is nothing more than a garden with few views and the ‘castle’ now sits below the keep and clinging to the side of the hill. The Luttrell family are largely responsible for everything at Dunster, having lived there from 1376 until 1976 (with a couple of blips in between). The castle we see today is nearly all left over from the Victorian ‘improvements’. Although there are still a few wonderful examples of early work and the place is crammed with portraits of the Luttrells down through the years, including a rather odd one of Sir John painted by Hans Eworth in 1550. Rather than the normal portrait of head and shoulders or full body, this one shows a bare chested Sir John, his fist raised at a bare chested girl holding an olive branch. Behind the girl are massed strange people in poses ranging from war-like to lovers. Over Sir John’s shoulder can be seen a ship on the high seas. Intriguingly there is a dead woman floating in the water under his arm. It’s all very dramatic. No-one actually knows what it means though some have suggested it represents his victory over France at some stage. Karen should know this picture as the original is in the Courtald. 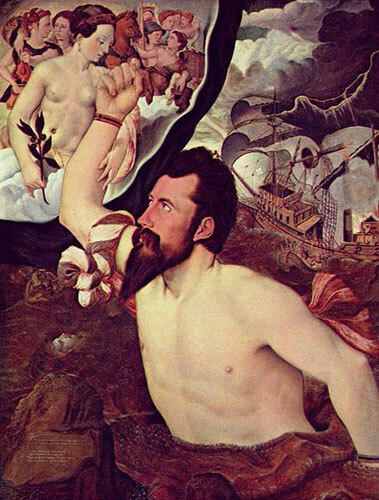 Although this is but a copy, it was painted in 1591. As we wandered the stately rooms, Mirinda, as usual, grew increasingly angry at the poor lives of the servants while the National Trust glorify the hard work of the aristocracy. I made her angrier than usual when I told her that the wealthy would decide to have archaeological parties on Sundays and drag their poor workers out to the fields in order to do the actual work of digging while they, the aristos, would sit under umbrellas and offer encouragement. Nuff said, I think. After doing Dunster Castle we wandered the streets of the village. A lovely, though very crowded, place. Lots of little shops and buildings that defy gravity. Unfortunately (read ‘fortunately’) there is no ATM in Dunster and most of the shops do not take plastic – you have to remember that this is a REAL medieval village – so we had to make do with window shopping. I need to mention here that Porlock also has no ATM so we’ve had to manage on very little scraps of cash purloined from the post office when it’s open. One place that does take cards in Dunster is Reeves. A fantastic restaurant that I wholeheartedly recommend. The name is the surname of the owners. The food is a delight and reasonably priced. They are also wonderful hosts. We had lunch there – a duck and warm salad & crème brulee for me, beef with thicko chips & meringues with pistachio for Mirinda. I have to report, apart from the top being slightly too thick, the brulee was perfect. Mrs Reeve was a teacher in Wolverhampton but decided running a restaurant was more rewarding than dodging missiles without recourse. We then visited the church, which is heralded as being ‘quite unusual’ and is featured in a book about unusual churches of Britain. I know I read that somewhere but for the life of me, I can’t remember where! However, it is true. It is an unusual church. St George’s, Dunster has a number of screens of great renown. 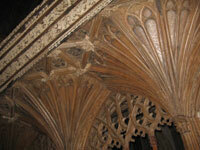 Firstly it has a fantastic screen built in 1499 that somehow managed to survive the Dissolution. It stretches the full width of the church (54 feet) and is strong enough to support three grown men (or so one of the women in the church told us, with great authority). There is another screen which effectively cuts off the altar from the rest of the church. This had something to do with a dispute between some Benedictine Monks and the parishioners. They couldn’t agree on a bunch of stuff and the matter was referred to the local head honcho in Glastonbury. It was decided to build a screen giving the monks the top bit and the parishioners and vicar everything else. Quite bizarre. Naturally the church has a lot to do with the Luttrell family – it’s a bit like the church at Petworth and less interesting for this reason. I much prefer a little church with no obvious benefactors. In fact, in the case of St George’s, since the Dissolution, the eastern end of the church has belonged to the Luttrell family…and remains so. Leaving St George’s we realized that someone had left the guidebook for Dunster in the toilet of the restaurant we’d had lunch in so we had to go all the way back, knock them up (they’d shut), and beg forgiveness. Mirinda did all that and we happily marched back to Sidney, guidebook in hand. It was then back to Porlock as we wanted to visit the craft fayre, only the craft fayre closed at 4:30, so we drove out of Porlock and wandered round the very small and slightly shabby village of Luccombe. ‘Luccombe’ may mean ‘enclosed valley’ though, perhaps, ‘hidden’ would be more apt. Old houses needing a bit of TLC, is pretty much all you can say about Luccombe. Even the church needed a bit of a hug. Though saying that, I preferred it to Dunster church. I say, when it comes to these little rural places, let sleeping ducks lie. At the risk of boring my readers, I’m going to talk a bit about this church now! 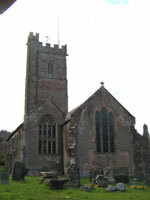 St Mary’s, Luccombe is partly 13th, partly 15th century with various bits of interest, like most churches. There! That’s all you’re getting. Mirinda reckons I go on about churches far too much so, hopefully, that’ll keep her happy. You may notice there’s not as many photos of churches in the photo album as well. That’s NOT because I didn’t take heaps. And here’s one just because! A big lunch meant a small dinner after which we watched the final episode of The Virgin Queen, then bed. Tomorrow is home time.